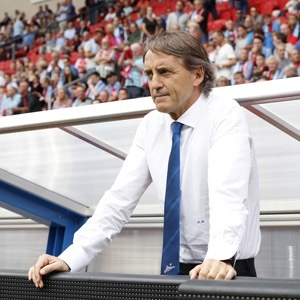 Moscow - Roberto Mancini's Zenit St Petersburg will hope to make it five wins in a row against Dynamo Moscow when they meet in the Russian Premier League on Sunday. But Mancini has warned his charges to take newly promoted Dynamo seriously after watching his side struggle to a 0-0 draw in their last league match before the international break. "We performed well in the first part of the season. But we've lost points in our last league game, being tired just three days after an important Europa League encounter," Mancini said. "Now after the break for international duties we need to refocus completely on the domestic league as winning the Russian title is our top priority this season. We can't afford to lose points again." Second-placed Lokomotiv will have to pass a stern test at Akhmat Grozny, who boosted their morale with a 1-0 away win over last season's runners-up CSKA after four consecutive league defeats. Lokomotiv manager Yury Semin said he was happy to strengthen his team's attacking line by signing Portuguese striker Eder on loan. "We desperately needed a new forward to spearhead our attack after Ari got an injury," he told Lokomotiv's website. "Hopefully, Eder will help us to solve this problem." Reigning champions Spartak Moscow, who have been winless in their last three league matches, will try to put an end to this series of misfortunes in Saturday's meeting with two-time former champions Rubin Kazan. Spartak are currently ninth, 11 points behind the leaders Zenit. However, Spartak skipper Denis Glushakov said he and his teammates were set to change the situation for the better in the near future. "I have no idea why Spartak's start to this season has been so poor," Glushakov said. "But we're set to keep on fighting, we have enough time to remedy the situation. The upcoming match with Rubin is an excellent chance to start doing that."